You may be asking why today is Moon Day. I like sharing unique and interesting holidays. On July 20, 1969, the USA put the first man on the moon. Neil Armstrong stepped onto the moon’s surface with these words. “That’s one small step for man, one giant leap for mankind.” So July 20 has become a day to celebrate the moon. The moon has a romantic side. Moonlit walks or kisses in the moonlight spell romance. I’ve always loved the line from Thomas Alan Waits’ song “Downtown Train,” which mentions the moon punching a hole in the nighttime. The picture above reminds me of that line. You can listen to Rod Stewart’s rendition of that song here. Here are a couple of excerpt from books I’ve written where I’ve used the moon. The first one is from MOMMY’S HOMETOWN HERO. “Good,” she said, her mind hopscotching from the threat of reporters to the threat of emotional danger Matt represented. Who would protect her heart if she couldn’t forget him when it was time to leave? She wanted to put aside her reservations, but the joking comment about the security system underscored the differences she couldn’t force from her thoughts. Before she could talk herself out of what she really wanted, Matt’s lips claimed hers, and the romance of a moonlit night replaced any gloom. This second one if from MONTANA MATCH. Disquiet crept into Parker’s mind, as he got up from the chair and walked to the window. He stared into the night. Light from the full moon shimmered across the snow. The moon was like a hole in the blackened sky and reminded him of the hole in his heart that nothing seemed to fill—even his little girls. How could he invite Brittany into his troubled life? But he’d already considered it. Heather was asking him to make a decision—one he wasn’t sure he was ready to make, despite the pressing need for a nanny. 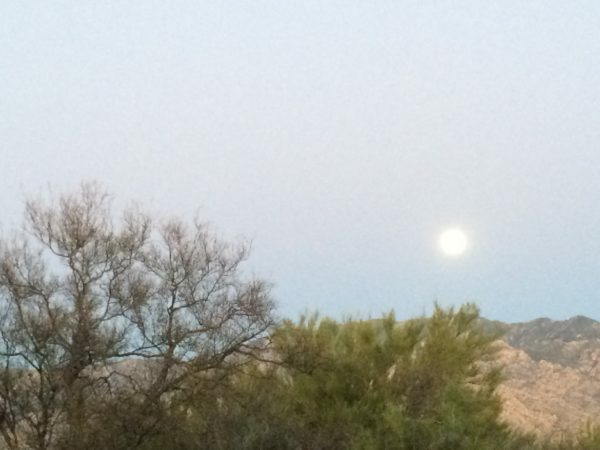 Where we live in Arizona, there are so many wonderful moonrises, especially when the moon is full. Here are few more photos. Notice the moon to the left. 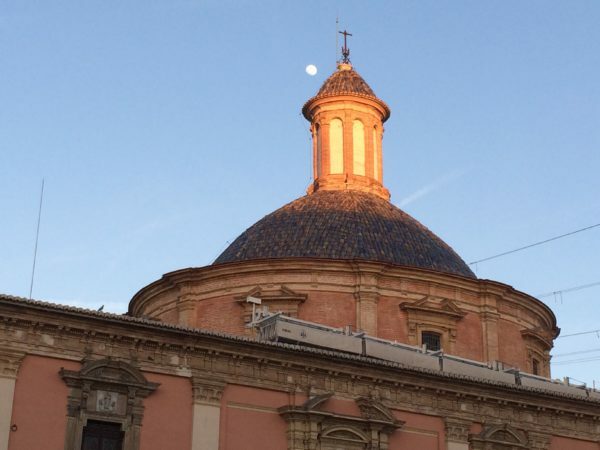 This was taken in Valencia, Spain, during our recent trip. The moon peeking over the mountain. What phase of the moon is your favorite? I’ll be giving away a copy of Montana Match to one person who leaves a comment on the blog. I will draw the winning name on July 22, 2017 at 9PM PDT. This is the perfect post for such a historical day, Merrillee. I love the full harvest moon, a sign that cooler, crisp air is on the way. Thanks, Jill. I love the moonrise where we live. Hi Merrillee, great photos. I love a full moon. We usually go camping over Easter, and the moon is this huge round ball in the sky, it is magnificent. It is autumn then, getting cold at night…just lovely! I remember some eerie ones, when there have been bushfires nearby in summer- the moon gets this red glow to it, and there is smoke haze in the air. Wemble, thanks. I’m also partial to the full moon. I remember when we lived in Florida and there were a lot of wild fires and the moon was red. My earliest memory is if the moon landing. My father sat me in front of the tv and said you need to watch this and remember it it. This is history being made in front of you! Paula, I also remember gathering around the TV to watch the moon landing. Thanks for the inspiring moon pictures and history! I love a full moon and especially an autumn harvest moon. Crescent moons are also a favorite. Often in the early morning when taking my grandsons to school we observe the moon high in the sky, as the sun rises. Many of us older folk have fond memories of the historic moon landing. You’re welcome, Renate. I also find it interesting to see the moon and sun in the sky at the same time. Sherri, I think there are still people who wonder if the landing was real. Wow. This sound like a wonderful story and would be a great birthday present since mine is on July 22. LOL. Thanks for the chance. Shadowblossom, happy birthday a few days early. I have always loved pictures of the moon. I also enjoyed the excerpt on your book! I love the way you often remind us of these quirky “Days”, Merrillee! And Montana match sounds wonderful! Thanks so much, Autumn. I enjoy sharing those quirky days. thanks for sharing about the moon day! I love full moon days, specially at the beach or countryside when you can actually see it better. I also think it’s extremely romantic!!! Laura, you’re welcome. I think that’s why I enjoy the moonrises so much where we live because the area is wide open and you can see it so well. It must be really nice! Moonrises are really beautiful, but the best I’ve seen from the moon was a moonset from the window of a plane. Unfortunately, that was before smartphones, so I have no picture of it. My favorite moon is when it’s full and close! So cool to look at! Great history as well. Jenny, thanks for stopping by. Thanks for sharing about today and the excerpts from your books. They really capture the full effect of the moon, which is my favorite phase. Can’t beat that. Thanks for the info on Moon Day, it is quite fascinating. Alyssa, you are welcome. I just used your name for a secondary character in my upcoming novella. Lori, that’s so cool that you were there when Neil Armstrong took off. It definitely was an exciting moment. I loved looking at your wonderful moon photos. Now I want to go out and take some of my own. I’m afraid that I never learned how to look at the moon and tell what phase it is. I just know that I love it when I can clearly see the moon whatever phase it is in. The really bright, almost orange looking, one really stops me in my tracks. Thanks for the chance to win a copy of your book. Sheila, that’s a good way to think of it. Great pictures! 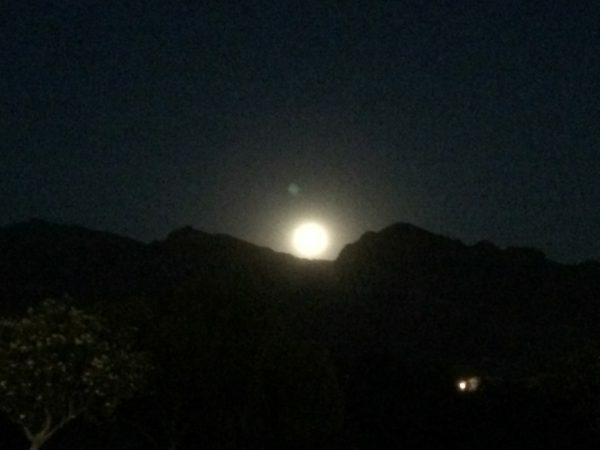 I love a full moon – especially a Supermoon that feels like you can reach out and touch it. Thanks, Julianne, Those Supermoons are special. I also love a full moon because you never know what’s going to happen at that time – changes in people, etc. And I’d love to win your book on my b-day, July 22nd, this Saturday! Thanks, Merrillee, for the contest! Wow! Another July 22 birthday. Ruth, happy birthday a couple of days early. I watched the moon landing with my mother on TV. My favorite phase of the moon is when it is growing. I was taught if you cut your hair on the growing of the moon, it would grow faster. Thanks for the opportunity to win a book! One of my favorite things to happen!!! Karen, I like when the moon is growing, too, but I’ve never heard that about your hair. I love your moon shots. My husband and I were fortunate enough to meet Buzz Aldrin (at Disney World, of all places!) when he was there for a book signing. I was a teenager in 1969, and like so many others, stayed glued to the television to watch the moon landing. Mary, how cool that you met Buzz Aldrin. I don’t pay a lot of attention to phase of moon. Would love to win any bok of yours. Jane, I mostly notice the full moon. What a great day in history! I remember reading about the space race with my students. I am a retired special ed. teacher! Thanks for the chance! Linda, that’s so cool that you shared the space race with your students. Your book looks fantastic! We live in “the country” and the area is known for its darkness…thus a popular astronomy retreat center is located here. We always get good glimpses of the moon! Jackie, we live in a dark community because there are observatories nearby. We have no street light, so it is dark in neighborhoods and very hard to read street signs at night. 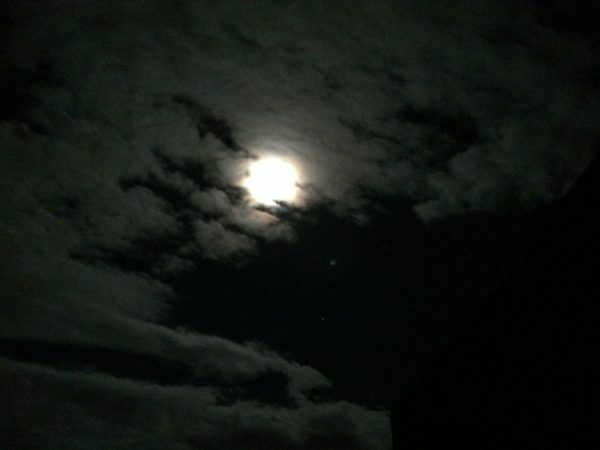 Thanks for sharing your pics of the moon! They are beautiful. Thanks, Karen. I’m glad you enjoyed them. Great pictures! I remember watching Neil Armstrong on the tv. I enjoy when the moon is full and appears as a huge orange ball, so close that you think you might be able to touch it. But I do love seeing all the phases of the moon, because they remind me of it’s Creator! I look forward to reading these books. Yes, the moon is a reminder of our creator. I love the full moon. It lights up the night sky and its so bright, peaceful and beautiful to look at. Maryann, it is beautiful. I can always tell when there is a full moon here because of our dark city, it really lights up the night. The full moon is my favorite! I love the full moon when it turns orange. My grown daughter has always had a fixation with the moon. I once bought her a tee shirt that had a full moon on it. When you turned the lights off it glowed in the dark. Gail, that is a cool shirt. Living in Louisiana can be tough to sit outside and enjoy moon gazing. You have a constant battle with the “skeeters”, and the heavy humidity adds to the misery. To fully enjoy moongazing,give me a full moon on a fall night, or an early spring night…before the “skeeters”find me! Jacqueline, those “skeeters” can be nasty pests. Thankfully, we don’t have many where I live. I enjoy full moons and here in Kentucky we make full use of both the Harvest Moon and the Hunter Moon. My 3 year old granddaughter has a fascination with the moon and she often looks for it when we are outside. Connie, my granddaughter also had a fascination with the moon when she was that age. I like a full moon! I like the crescent moon & the harvest moon :-) I just like seeing the moon when we are able to on the coast, sometimes it’s much too cloudy to see. Talking about the moon and sending Neil Armstrong to the moon for the first time; if you haven’t seen it, I highly recommend the movie that just came out “Hidden Figures”. It’s about the black women behind NASA who were pivotal in launching our boys for the first time. I really learned some history in that :-) Great movie! I have this book Merrillee so no need to enter my name. Trixi, “Hidden Figures” is definitely worth watching. When I visited China 4 years ago, I would look at the moon and wonder if my husband was looking at it too. Then I realized, that we were a day ahead and he was looking at the sun. My Grandfather, who was born in the early 1900’s, never believed that we went to the moon. My husbands grandfather never believed about the moon landing either! He thought it was staged. I remember going next door to watch the moon landing because they had a color TV. To my surprise it was not in color. Gail, I remember that it was in black and white, too. I guess there were no color cameras on the moon. I love a full moon and I am always amazed at how much detail I can see on it with my naked eye.